The temple of Sri Varaha Narasimha Swamy is located in Simhachalam, very close to Visakhapatnam which is one of the fast developing cities in the east coast of Andhra Pradesh. The city is known for its natural beauty and has much tourist potential, virgin beaches and pristine sea waters. The city lies on the main line of Howrah-Madras mail and is easily accessible. The local people are innocent, lovable and hospitable too. The ancient temple of Lord Varaha Lakshmi Narasimha Swamy at Simhachalam is one of the important temples of A.P. According to Hindu scriptures, Lord Narasimha Swamy is one of the 10 incarnations of Lord Vishnu. Narasimha Swamy has a peculiar beastly form with a lion's face and a human body. He emerged from a pillar when it was broken by the demon King Hiranyakashyipa - father of Prahlad who was a staunch devotee of Lord Vishnu. Simhachalam is one of the famous temples of Lord Narasimha Swamy. This 11th century temple is located on a hill and is at a distance of nearly 15 Km from Visakhapatnam. The temple with its 252+ inscriptions in Oriya (the language spoken by the people of Odisha) and Telugu, has historical importance. The beautiful 16-pillared Natya Mandapam (Dance Hall) and the 96-pillared Kalyana Mandapam (Marriage Hall) stands as a testimony of the rich and expert skilled work of the artisans. The uniqueness of the deity is that it is covered with coats and coats of sandalwood paste and hence the Moolaviraat (the original deity) is not seen but looks like a lingam due to the coats of sandalwood paste. Few days prior to Chandanotsavam all the dried coats of sandalwood paste are removed from the main deity. Chandanotsavam is a special religious festival which is celebrated on Vaisakha Suddha Tadiya day i.e the 3rd day after Amavasya in the Hindu month of Vaisakh i.e. on Akshaya Tritya / Akha Teej - the gold rush day. On this auspicious day devotees are allowed to have the darshan of Moolavirat or Nijaroopa Darshan of the original deity of Sri Varaha Lakshmi Narasimha Swamy. And late night on this day a fresh coat of sandalwood paste is smeared on the deity after the darshan is stopped for devotees. 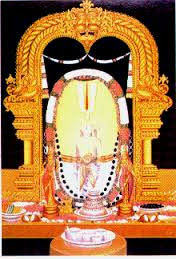 Hence devotees throng to the temple on this auspicious day to have the Nijaroopa Darshanam of the Lord. The temple opens daily at 4.00 a.m with the Suprabhatam. From 6.30 a.m onwards, the temple is open for devotees for darsanam of the Lord. 12:15 in the noon to 2.30 p.m, temple is open to devotees for darshan. 2.30 p.m to 3.00 p.m closed. 3.00 p.m to 7.00 p.m open to devotees for darshan. 4.00 p.m to 6.00 p.m devotees can have free darsanam. Accommodation There are a number of budget as well as luxury hotels in and around Visakhapatnam. And you can get almost international standard rooms at a reasonably good price in these hotels like Hotel Dasapalla, Hotel Dolphin, Fortune Inn, The Taj, The Park Hotel etc.